The raging descent of the Dies irae in Verdi’s monumental Requiem is some of the opera composer’s most dramatic music, and it was attacked with thunder and fury by the Sydney Symphony Orchestra and Sydney Philharmonia Choirs under the baton of Italian maestro Oleg Caetani on Thursday evening, in a concert streamed live across the globe as the SSO’s first foray into international Make Music Day celebrations. Verdi wrote his setting of the Latin Requiem Mass – composed for the concert hall – in 1874, his fame already well established by the likes of Rigoletto, Aida and Il Trovatore. The pianist and conductor Hans von Bülow, after a glimpse of the score, snipingly described it as an “opera in ecclesiastical vestments” (he later apologised) but it was the theatre of the work that Caetani embraced in this performance, which spanned whispered prayers to apocalyptic roars. The cellos opened the work with a hushed, transparent sound, Caetani employing the lightest of touches, before the music gradually unfurled with the chorus’s quiet “requiem”s, then caught fire in the Te decet hymnus. 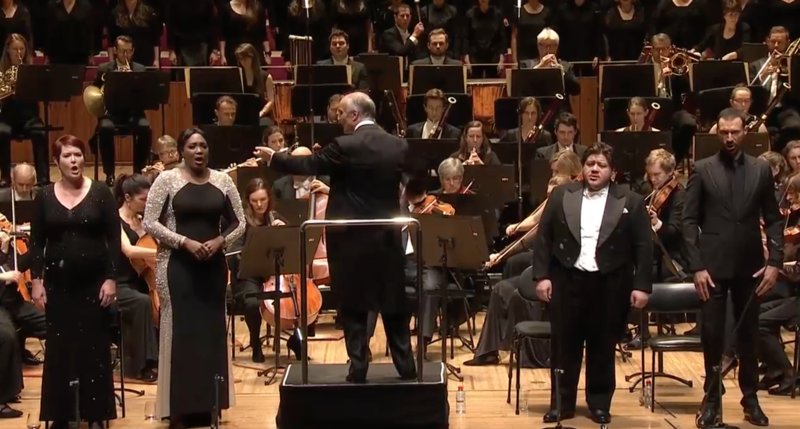 The singers of the Sydney Philharmonia Choirs (prepared by Music Director Brett Weymark) brought flexibility and expressivity to the performance – their whispers in the Dies irae were hauntingly and viscerally projected, while the sound in the climaxes was powerfully compelling. The diction overall was solid, though there were some moments of lost clarity amongst the vast forces, but the nimble, almost conversational delivery of the music was very effective. The four soloists, all very much at home on the opera stage, brought a drama to the Requiem beyond what is often seen in the concert hall. Australian mezzo Catherine Carby brought a refined, warm colour to her part – particularly in the opening of the Quid sum, where she shone above Todd Gibson-Cornish’s bassoon – while Jérôme Varnier (whom audiences heard last year as Arkel in the SSO’s Pélléas et Mélisande) contributed a clean, coppery bass. Opera Australia regular Diego Torre was a particular highlight, his penetrating, burnished tenor unleashed seemingly effortlessly. The change in timbre he produced in the opening of the Hostias – from gently soft-edged to brightly gleaming – was exquisite. The standout, however, was American soprano Angel Blue, making her SSO debut, her supple yet formidable voice floating deliciously in the Offertory and soaring in the Libera Me, her colours vivid, and her final prayer delivered with a moving, human joy. While there were some particularly fine soprano and mezzo moments – and ensemble moments across the board – there were a few points, when the orchestra dropped out and the soloists were on their own, when the trios and quartets felt slightly insecure pitch-wise, stabilising as soon as the orchestra rejoined. The SSO, led by guest concertmaster Emma McGrath (up from the Tasmanian Symphony Orchestra), was impeccable, Caetani balancing the large forces effectively, the strings colourful and vivid, the trumpet crescendo in the Dies irae thrillingly paced and crisply rendered. This was a performance that embraced the human drama of Verdi’s Requiem, drawing on the operatic elements woven into the mass, and highlighting – particularly in Angel Blue’s nuanced performance – the more intimate, personal details in this mighty epic. Unfortunately, this recording's Lady M fulfils all of Verdi's expectations and then some. A splendid start to the season, with storytelling at the forefront.